In that study the type of patterns, the role representation types in mathematics, especially in pattern activities were discussed and some activity examples are given for students which have potential to develop their algebraic thinking skill requiring translation between representations such as symbolic to figural. Bu çalışmada, örüntü türleri, matematikte özellikle örüntü etkinliklerinde temsillerin rolü tartışılmış ve öğrencilerin cebirsel düşünmelerinin gelişimine potansiyel katkısı olan temsiller arası geçiş gerektiren (örneğin sembolik temsilden şekil temsiline) etkinlik örneklerine yer verilmiştir. Ainsworth S. (2006). DeFT:A conceptual framework for considering learning with multiple representation. Learning and Instruction, 16, 183-198. Bassarear, T. (2008). Mathematics for elementary school teachers. (5th edition). USA: Brooks/Cole. Cai, J & Lester F. K. (2005). Solution representations and pedagogical representations in Chinese and U. S. classrooms. Journal of Mathematical Behavior, 24, 221-237. Cathcart, W. G., Pothier, Y. M., Vance, J. H. & Bezuk, N. S. 2003. Learning mathematics in elementary and middle schools. (3rd Ed. ). N.J. : Merrill/Prentice Hall. Fennell, F. S. & Rowan, T. (2001). Representation: An important process. Teaching and Learning Mathematics, 7(5), 288-292. Fox, J. (2005). Child-initiated mathematical patterning in the pre-compulsory years.In Chick, H. L. & Vincent, J. L. (Eds.). Proceedings of the 29th Conference of the International Group for the Psychology of Mathematics Education, (Vol. 2 , pp. 313-320). Melbourne: PME. Frobisher, L & Threlfall, J. (1999). Teaching and assessing patterns in number in the primary years. In A. Orton (Ed.). Pattern in the teaching and learning of mathematics (pp.84-103). London and New York: Casse. Janvier, B. D. & Bednarz, N. (1987). Pedagogical considerations concerning the problem of representation. Problems of representation in the teaching and learning of mathematics. Editor: Claude Janvier. New Jersey: Lawrence Erlbaum Associates. Lesh, R., Post, T., & Behr, M. (1987). Representations and translations among representations in mathematics learning and problem solving. In C. Janvier (Ed. ), Problems of representation in the teaching and learning of mathematics (pp. 33-40). Hillsdale, NJ: Lawrence Erlbaum. Lin, F-L., Yang, K-L &Chen, C-Y.(2004). The features and relationships of reasoning, proving and understanding proof in number patterns. International Journal of Science and Mathematics Education, 2, 227–256. Mc Garvey, L. M. (2012). What is a pattern? Criteria used by teachers and young children. Mathematical Thinking and Learning, 14 (4), 310-337. MEB (2009). İlköğretim matematik dersi 1-5.sınıflar öğretim programı. [Primary School Mathematics Curriculum (1.-5 grades)]. Ankara Devlet Kitapları Basımevi. Nathan, M. J. & Kim, S. (2007) Pattern generalization with graphs and words: A cross-sectional and longitudinal analysis of middle school students’ representational fluency. Mathematical Thinking and Learning, 9(3),193-219. National Council of Teachers of Mathematics (NCTM) (2000). Principles and standards for school mathematics. Reston, VA: National Council of Teachers of Mathematics. Orton, A. & Orton, J. (1999). Pattern and the approach to algebra. In A.
Orton (Ed. ),Pattern in the teaching and learning of mathematics (104-120). London and New York: Cassell. Radford, L. (2006). Algebraic thinking and the generalization of patterns: A semiotic perspective. Alatorre, S., Cortina, J.L., Sáiz, M., and Méndez, A.(Eds). Proceedings of the 28th annual meeting of the North American Chapter of the International Group for the Psychology of Mathematics Education. Mérida, México:Universidad Pedagógica Nacional. Reys, R. E., Suydam, M. N., Lindquist, M. M. &Smith, N. L. (1998). Helping children learn mathematics. (5thEd.). Needham Heights: Allyn&Bacon. Rivera, F. D. & Becker, J. R. (2007). Abduction–induction (generalization) processes of elementary majors on figural patterns in algebra. Journal of Mathematical Behavior, 26, 140–155. Rivera, F. D.& Becker, J. R. (2008). Middle school children’s cognitive perceptions of constructive and deconstructive generalizations involving linear figural patterns. ZDM Mathematics Education, 40,65–82. Rivera, F. (2013). Teaching and learning patterns in school mathematics. psychological and pedagogical considerations. Springer. Souviney, R. J. (1994). Learning to teach mathematics (2nd Ed.). Englewood Cliffs: Macmillan Publishing Company. Smith, S. P. (1997). Early Childhood Mathematics. Needham Heights: Ally&Bacon. Stacey, K. (1989). Finding and using patterns in linear generalizing problems. Educational Studies in Mathematics, 20, 147–164. Steele, D. (2008). Seventh-grade students’ representations for pictorial growth and change problems. ZDM Mathematics Education, 40, 97–110. Threlfall, J. (1999). Repeating patterns in the early primary years. In A. Orton (Ed.). Pattern in the teaching and learning of mathematics (pp.18-30). London and New York: Casse. Van de Walle J. A. (2004). Elementary and Middle School Mathematics. Teaching Developmentally. (5th ed.). Boston: Allyn &Bacon. Warren, E. & Cooper, T. (2006). Using repeating patterns to explore functional thinking. APMC 11 (1), 9-14. ISNAD KILIÇ, Çiğdem . "Örüntü Etkinliklerinde Temsil Türlerinin Rolü". 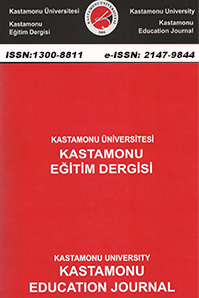 Kastamonu Eğitim Dergisi 24 / 3 (July 2016): 1263-1270.